The bipolar stimulators are used for evoked potentials exams to study the response of the Central Nervous System to a sensory stimulus, analyzing the nerve pathways that carry information from the periphery to the brain. In particular, the Motor Evoked Potentials (MEP) are studied, that is the way that leads the stimulus from the motor cerebral cortex and that through the spinal cord reaches the motor neurons and then the muscles. 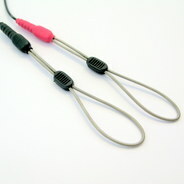 The electrodes of the stimulator are placed on the point to be stimulated with a light pressure and secured with a Velcro strap or held in place by the operator with the knob. The BIONEN stimulators are supplied with either steel electrodes and felts. 4141.002 FELTS Ø=8mm 100 pcs. 0062.026 Velcro Wraparaound L=50cm 1 pcs. 0062.027 Velcro Wraparaound L=30cm 1 pcs.